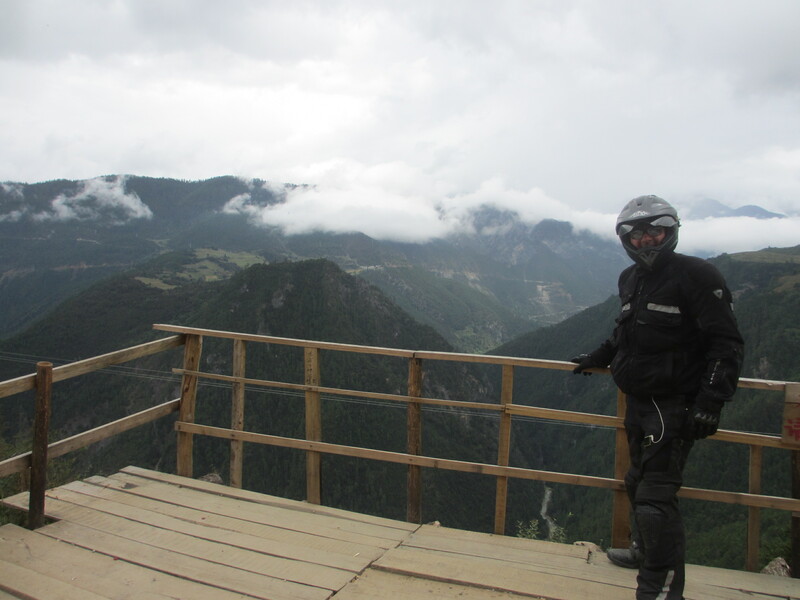 Er Hai … they say its very dangerous to ride without a helmet. 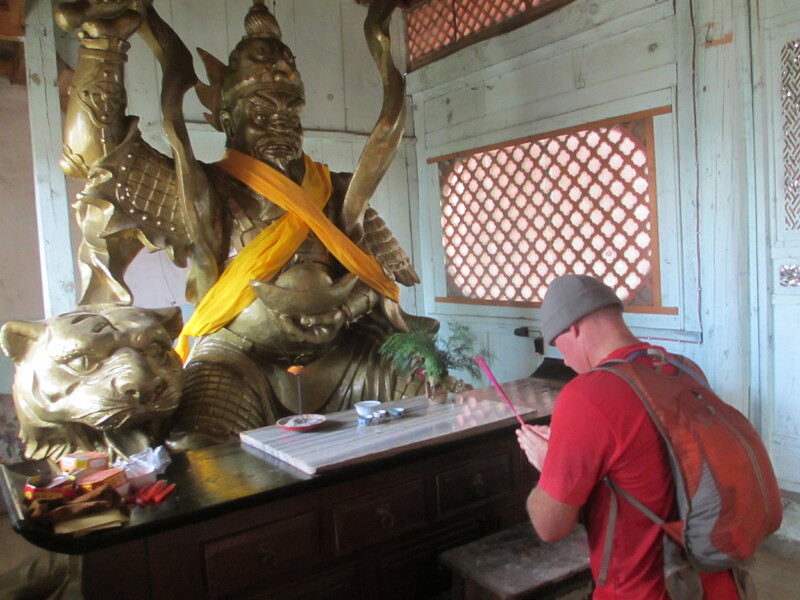 They are right… I got very burnt. 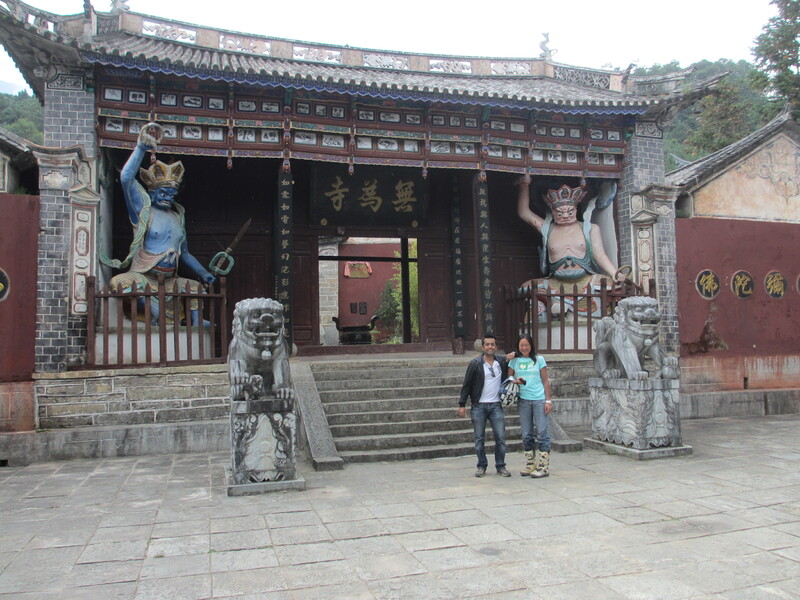 Fanny and Dinesh (Dino) Nihalchand at Wu Wei Si (Monastery above Dali) This is where I studied Taijiquan in 2008 during a semester break from Mandarin studies at Tsinghua University in Beijing. 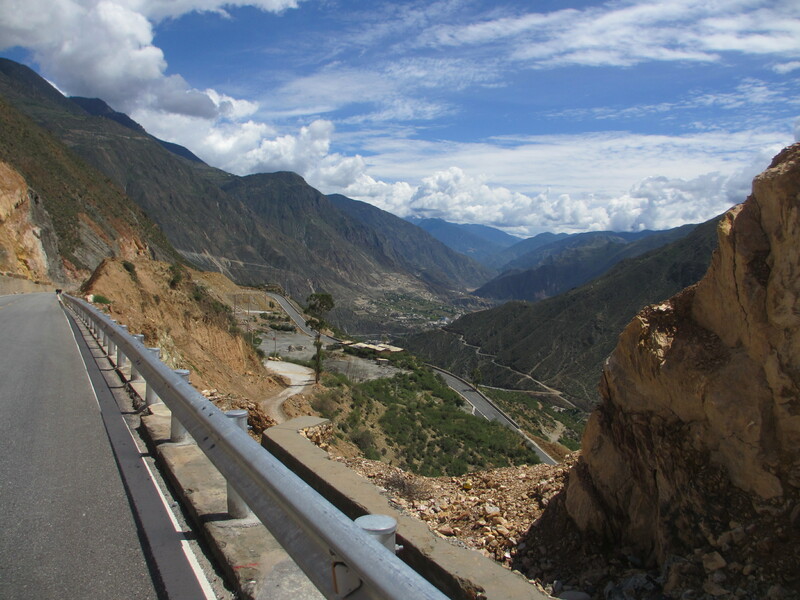 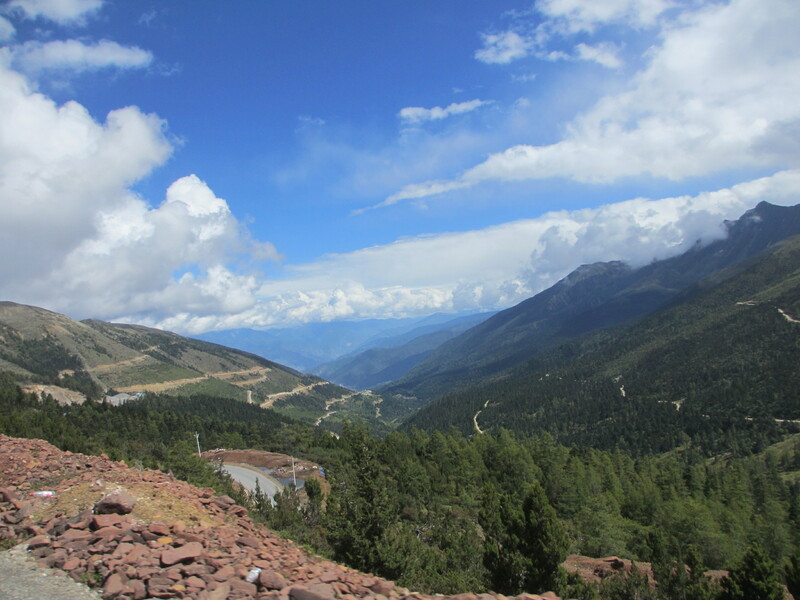 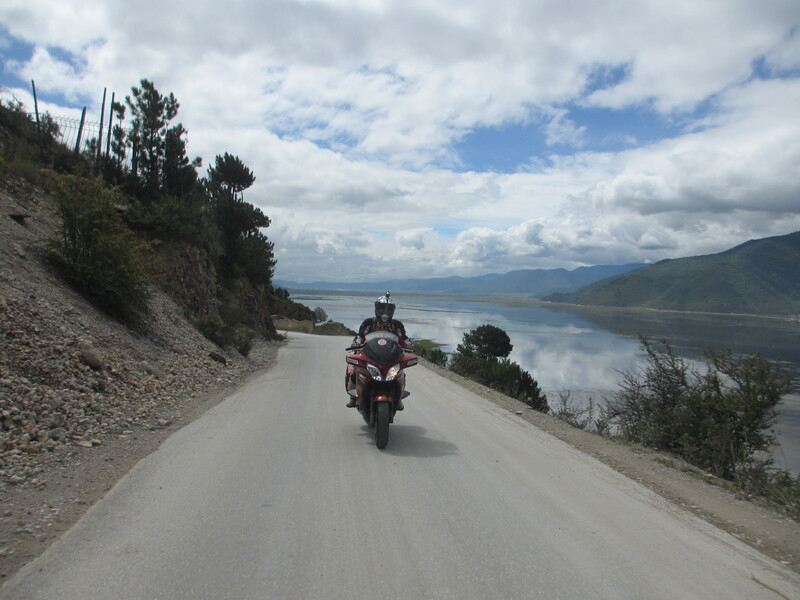 The long road meanders, twists and turns up to 4,000 meters and then down to 3,000 meters many times. 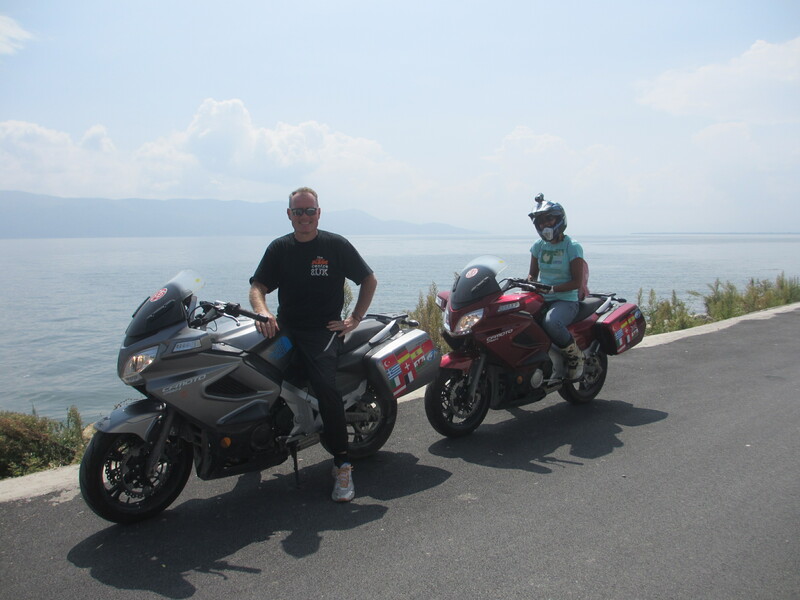 Quite superb biking conditions and TR650s going really well. 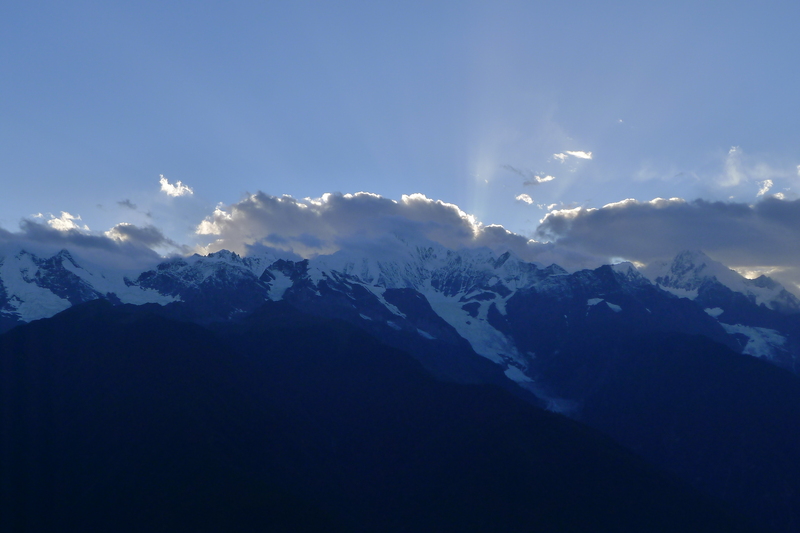 Bai Ma Xue Shan at 5,460 meters behind us. 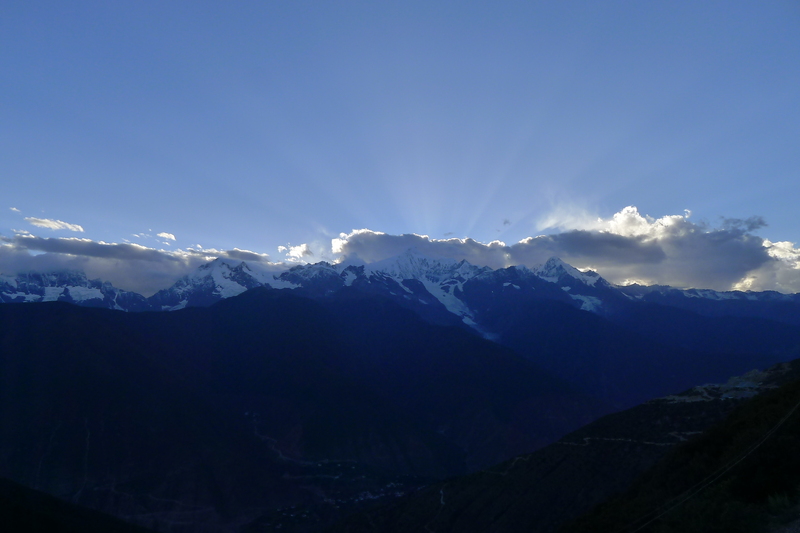 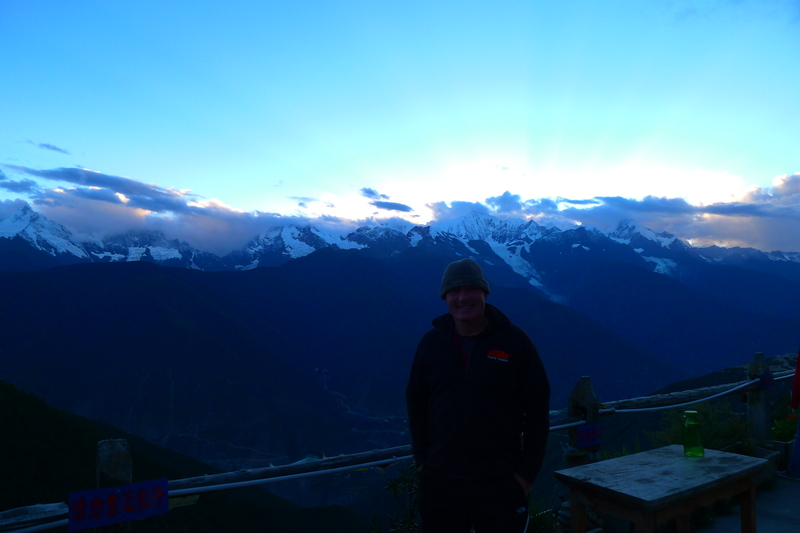 And at the end of a superb day’s riding we reach fei lai si (Flying Temple) where on the other side of the deep valley as the sun is setting is mei li xue shan (Beautiful Snow Mountain) at 6,740 meters. 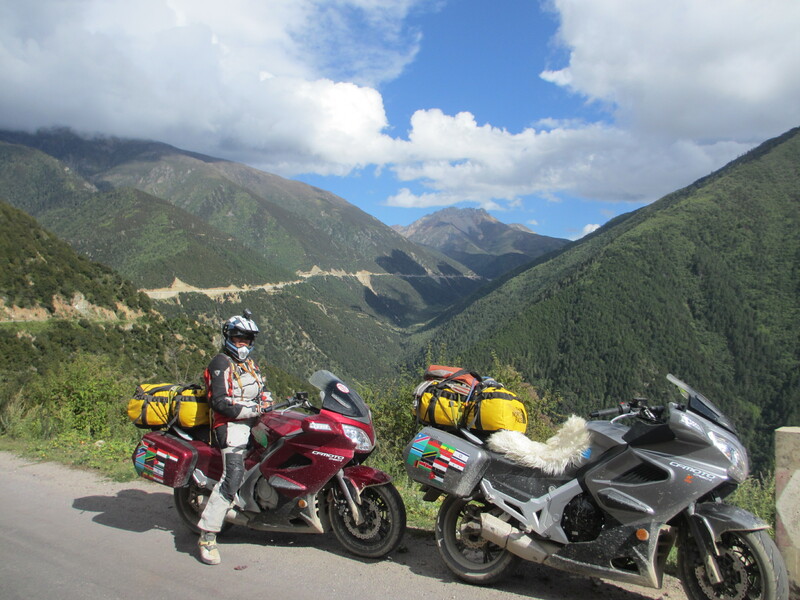 Fanny with our bikes ….with mine taking on a more “sheepy” look to relieve the piles. 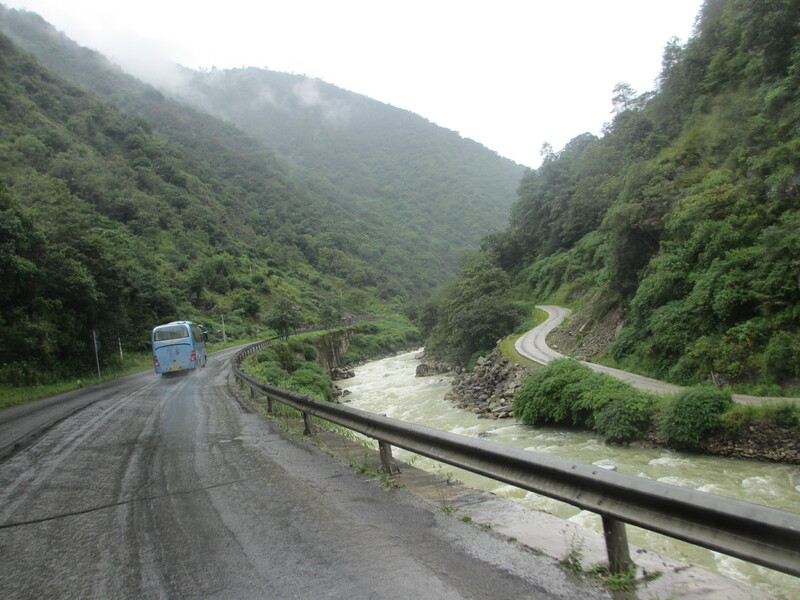 Its all too easy to look around in wonder at the magnificent scenery as you cruise along at 4,000 meters and forget that the weather and trucks take their toll on the roads. 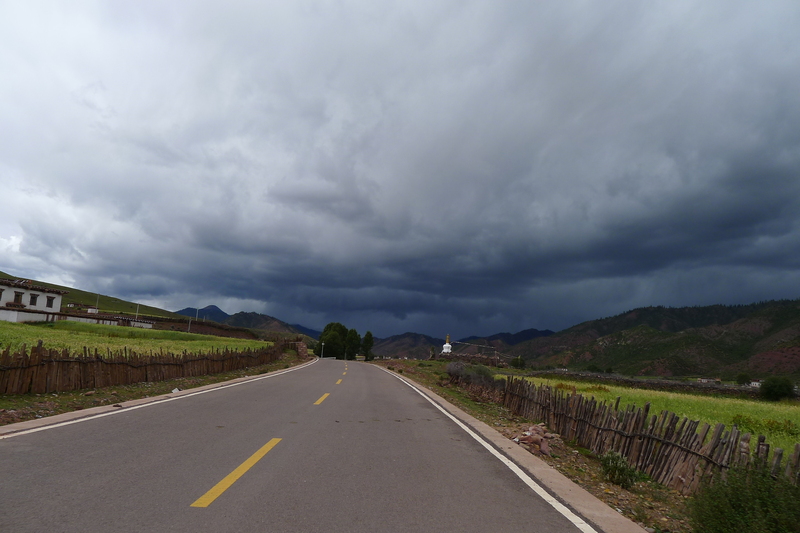 Sometimes the road just disappears which could be interesting if you didn’t stop in time. 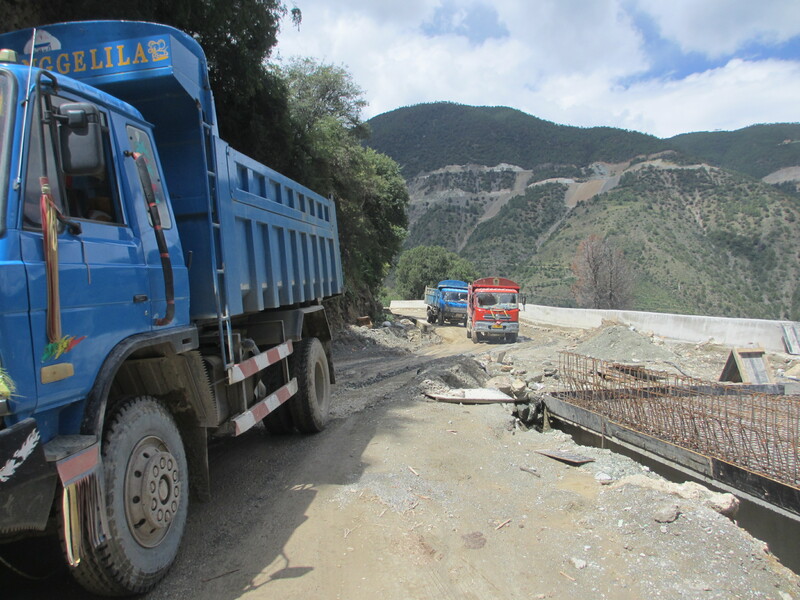 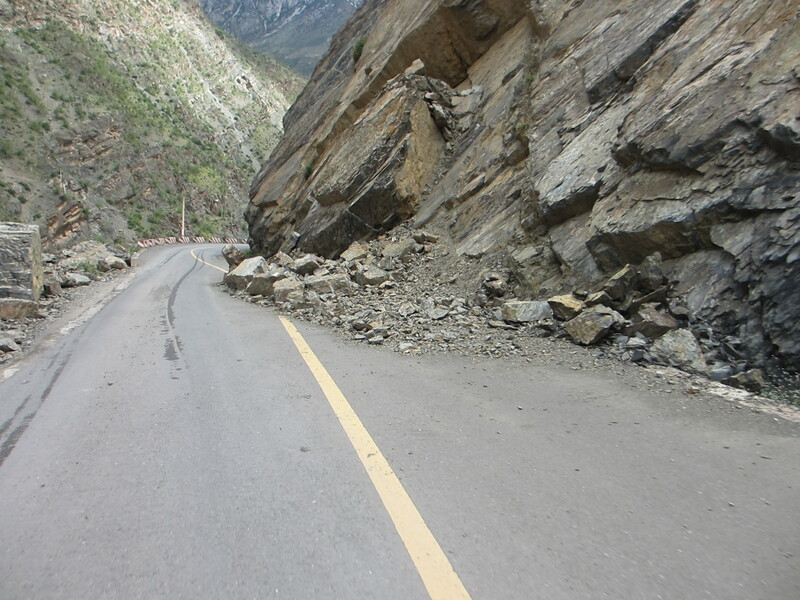 The road is strewn with rocks and debris that fall down the mountain sides. 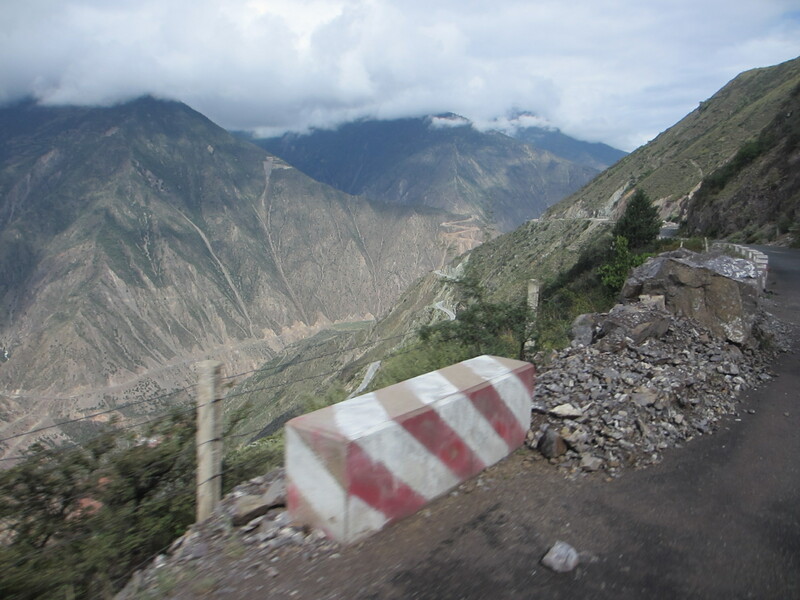 We saw hard working people clearing it up all the time, but sometimes the whole road is covered or missing. 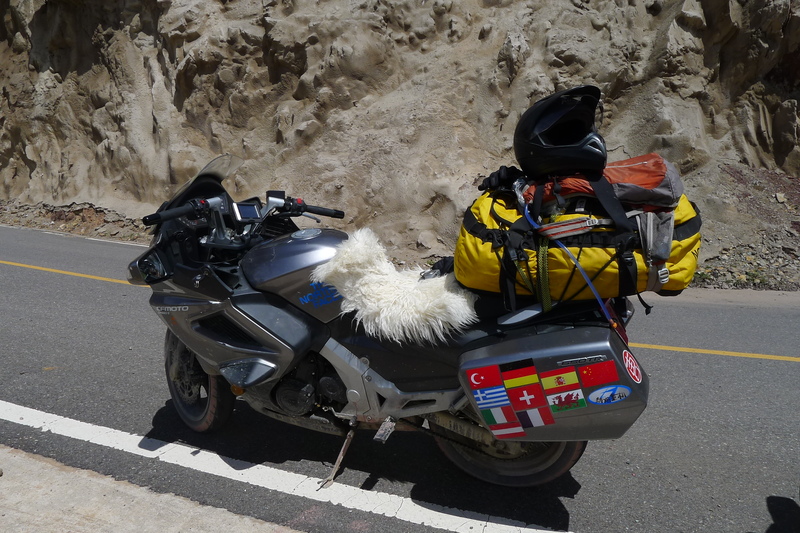 Next some yak horns on the front and a Tibetan multi coloured mudflap on the back…then we are sorted. 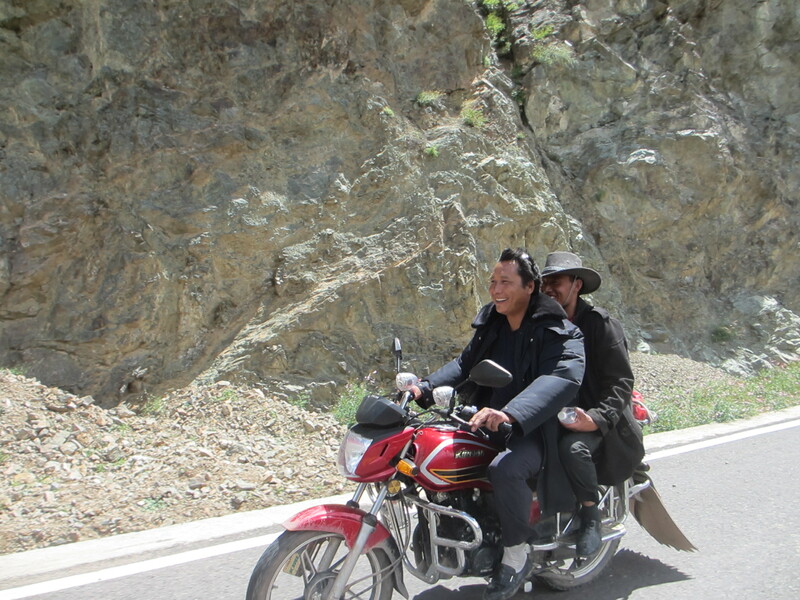 Some fellow bikers in Tibet. 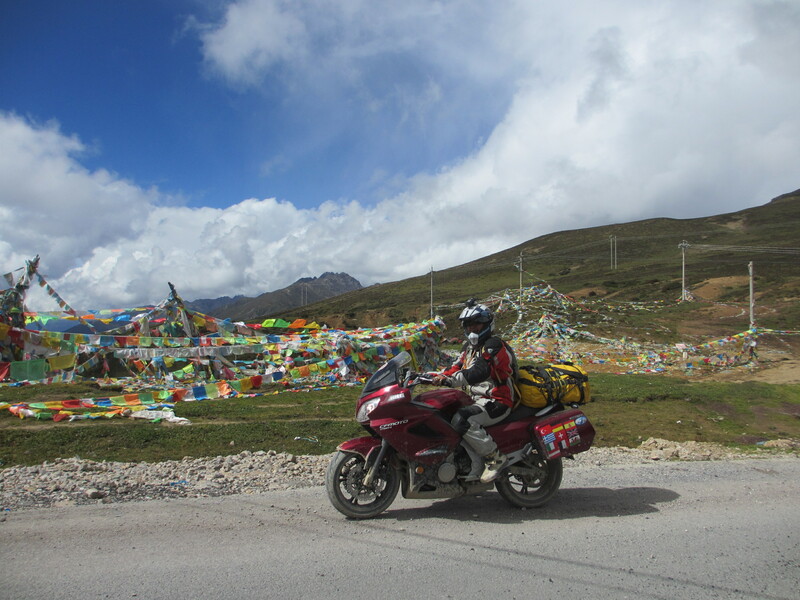 I have to say two wheels with an engine is the way to do it at 3-4,000 meters. 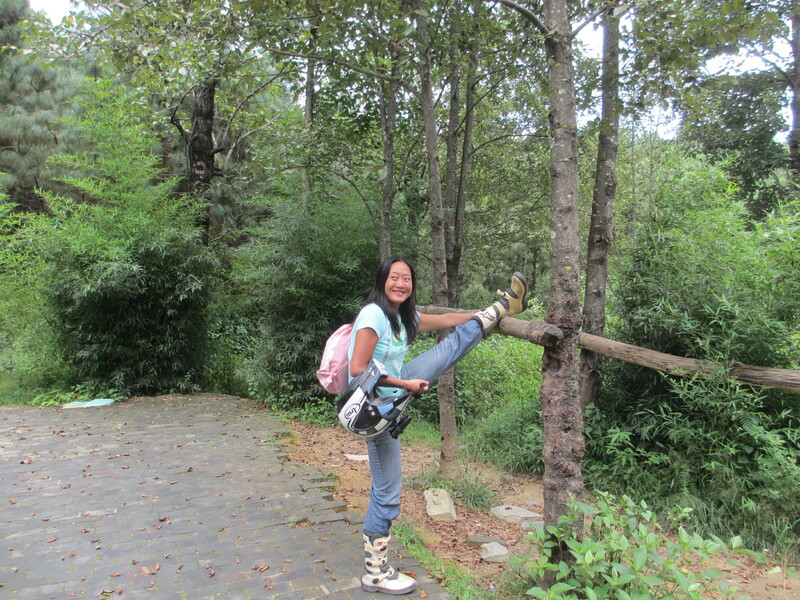 I am out of breath doing up my boots. 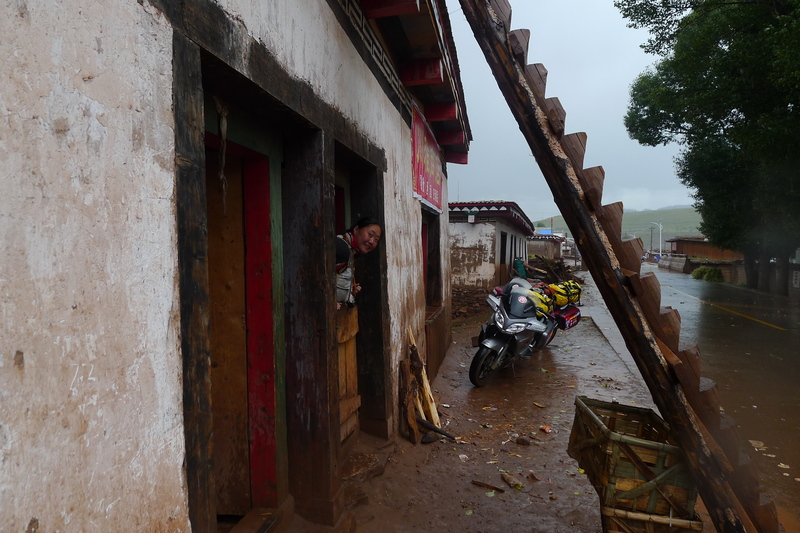 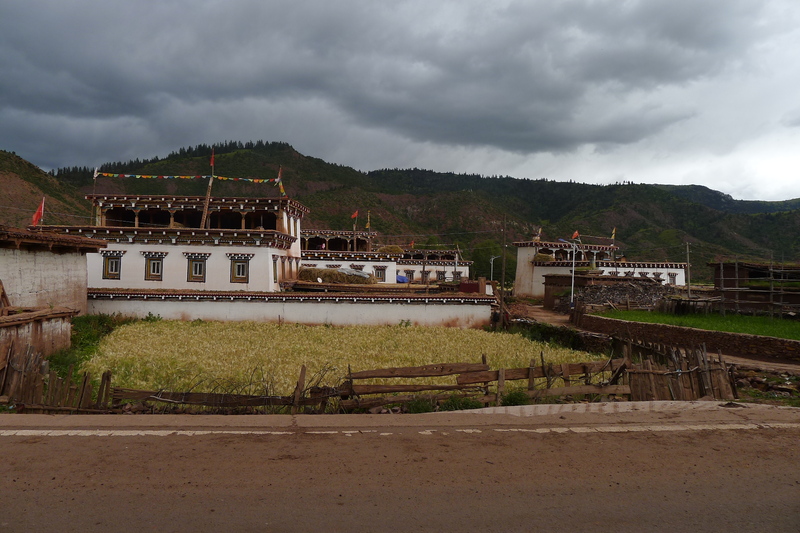 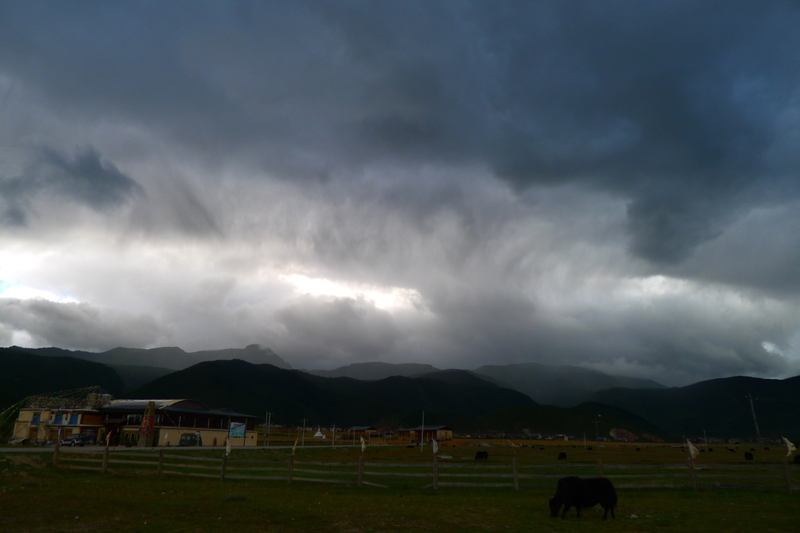 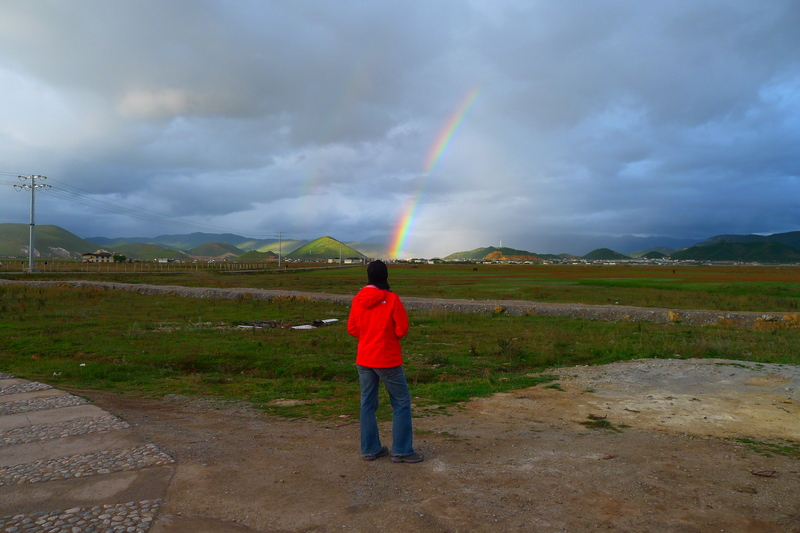 I am not keen on getting wet, and I particularly dislike thunder and lightening and so we took refuge in a small Tibetan village as this storm crashed and banged passed us. 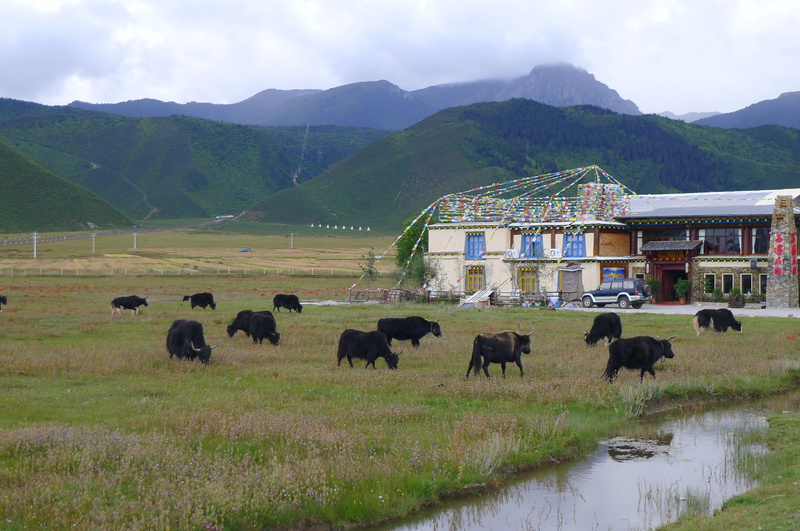 One of many Tibetan farm houses we passed. 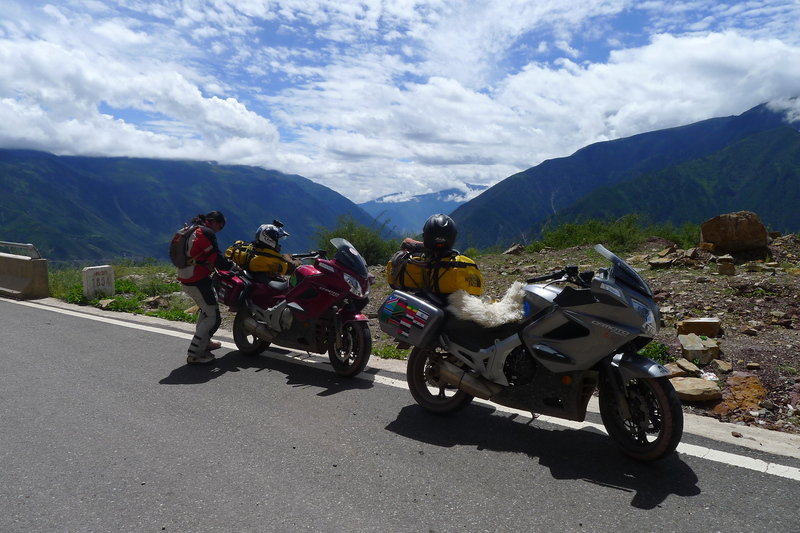 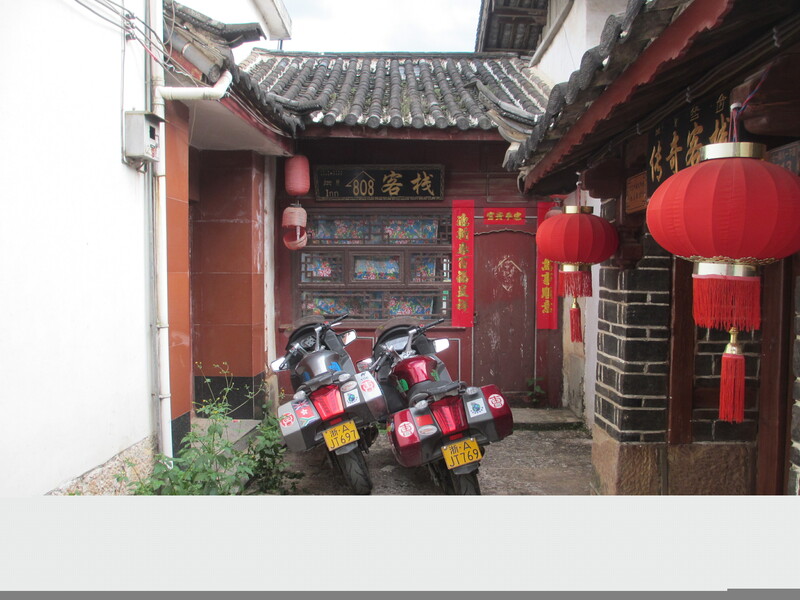 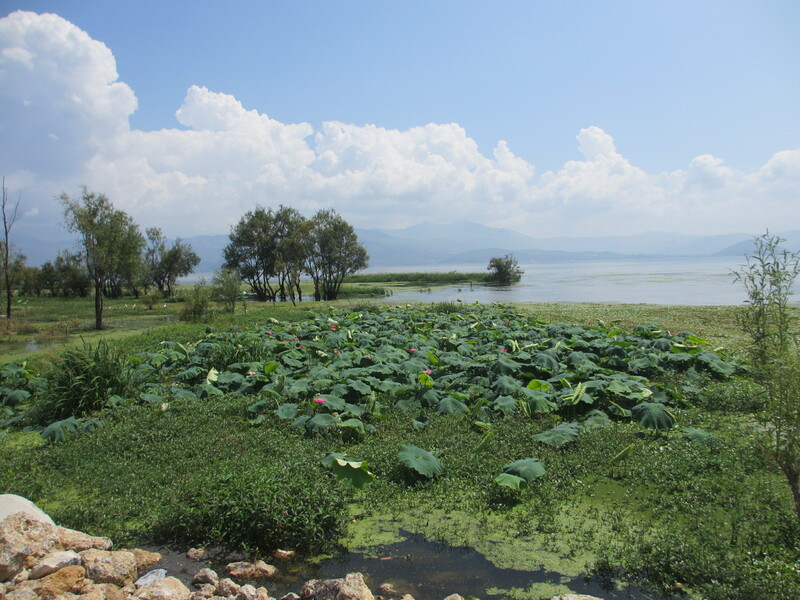 This entry was posted in CF Moto 650TR, China, Fanny, Rupert, Tibet, Yak. 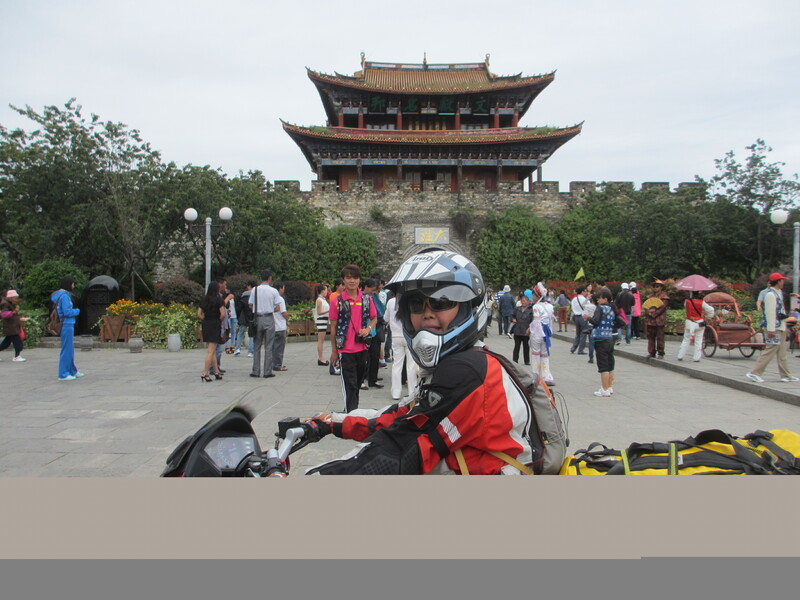 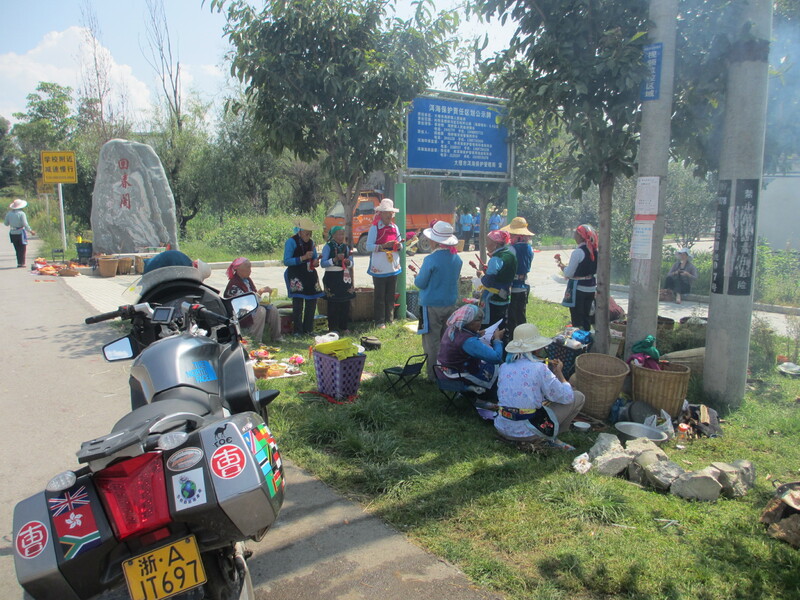 Tagged 650 TR, adventure, bike, CF Moto, China, Dali, Kunming, Lijiang, Shangrila, Yunnan, 昆明， 云南， 丽江， motorcycle.